"President Xi, in a wonderful humanitarian gesture, has agreed to designate Fentanyl as a Controlled Substance, meaning that people selling Fentanyl to the United States will be subject to China's maximum penalty under the law," White House Press Secretary Sarah Huckabee Sanders announced in a Saturday night statement. The agreement came as the two leaders joined other representatives of the G20 nations in Buenos Aires, Argentina, for the organization's annual summit. 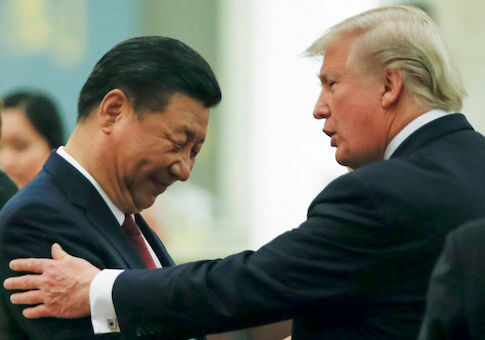 The two had aimed to broker a deal end their respective countries' escalating trade war. The scheduling of fentanyl was part of a package deal, offered by Xi to stop Trump from raising tariffs on some $200 billion worth of Chinese goods. China's foreign ministry further clarified the government's intention to schedule "the entire category of fentanyl-type substances as controlled substances, and start the process of revising relevant laws and regulations." Fentanyl is a synthetic opioid, which means that it is produced in a lab (rather than derived from farmed poppies) and binds to the same receptors in the brain as other opioids like morphine and heroin. Because it is synthesized, fentanyl has a substantial number of "analogs," drugs which mimic its effects while having a slightly different chemical structure. Thanks largely to pressure from American negotiators, China had previously scheduled a number of these analogs, as well as two precursors for fentanyl synthesis. But the across-the-board scheduling of all analogs, if actually implemented, could substantially change the shape of Chinese drug production and thereby the U.S. drug crisis. That is because China is the major source for most of America's fentanyl supply. The drug and its analogs are mass-produced in Chinese labs, then shipped either to Mexico to be smuggled across the border or, often, sent in the U.S. mail. The direct result is that fentanyl has flooded the U.S. market, in turn becoming the primary driver of surging drug overdose deaths. As such, the scheduling of fentanyl will permit Chinese narcotics officials to go after the domestic producers currently hiding behind the nation's limited drug controls. The Department of Justice has indicted numerous Chinese traffickers; Chinese police may now go after these individuals, attacking the supply of fentanyl at its source. At the same time, it is unclear what the unintended consequences of such a crackdown might be. The nature of the synthetic drugs market is such that dealers regularly hide behind the nominal legality of highly addictive but not-yet scheduled drugs—attacking synthetic opioids may cause traffickers switch to new, potentially more potent, drugs instead. It could also indirectly lead to traffickers' base of operations changing; as a Brookings analysis noted, "Places such as Indonesia, Nigeria, and South Africa—the last already a robust producer of synthetic drugs—can quickly become the new global hotspots of production and international controversy should the current leaders be dethroned." This entry was posted in Issues and tagged China, Donald Trump, Drugs, Opioids, Xi Jinping. Bookmark the permalink.